With the quickly-approaching release of Pokemon X and Y, I’d like to share with you a bunch of things about the Pokemon handheld games; stuff I wish I knew before I played through entire games. I’d like to start out with some high level meta game: Pokemon tiers. Even if you’re not into intense multiplayer online battles with others, it’s still cool to see which pokemon are labeled as the best, and why. Check out the site I’ve linked to each tier name, there is some useful information about every particular Pokemon. The Ubers are pokemon that are just too good. These pokemon make you cry “no fair,” “hax,” and “OP.” Game Freak, plz nerf. Examples: Mewtwo, Deoxys, Blaziken. These pokemon are some of the best. Their base stats and movepool are just generally a bit better. Or, a particular pokemon has one certain combination of ability, move, etc. that pushes it to this top tier. Examples: Dragonite, Gyarados, Jirachi. The Underused tier has a lot of great pokemon. Something such as a strong counter, or lack of the “wow” factor, may place pokemon here. But don’t be deceived by the UU tier – There are many very strong, simply underused Pokemon here. Examples: Raiku, Blastoise, Arcanine. 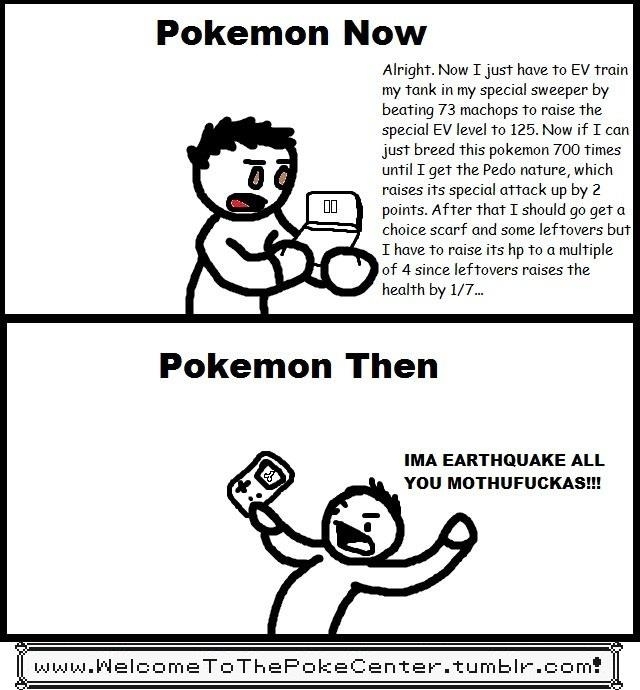 The weaker pokemon. Each pokemon here pretty much has a different pokemon who can completely outclass every stat, movepool, and ability that would be a better choice for your team. Examples: Meganium, Articuno, Lapras. Other things I really wished I knew before I ran through my Pokemon games: Natures. Each “Nature” increases a stat by 10%, and decreases a different stat by 10%. This can be extremely crucial, as a pokemon with a decrease in a main stat will really be useless. If you have Modest Gyarados, you’re gonna have a bad time. Some Natures do nothing, neither increasing or decreasing. While this won’t benefit you, it’s better than have a nature that hinders your pokemon.